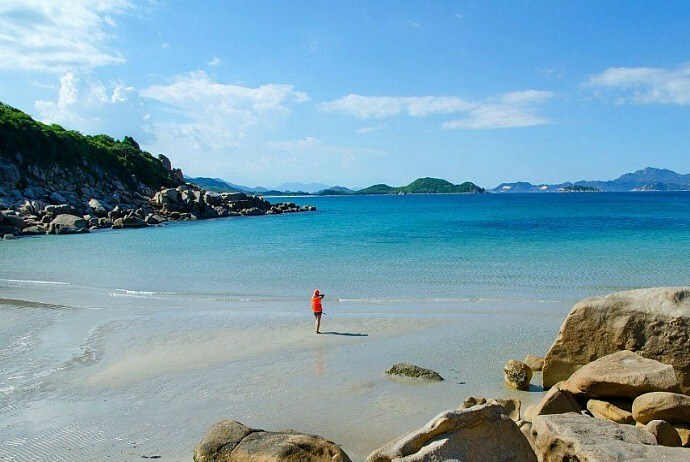 Binh Hung (Bình Hưng) island is located in Cam Binh(Cam Bình) commune, Cam Ranh town, nestled at the foot of the mountain pass of the seaside road Binh Tien – VinhHy (Bình Tiên – Vĩnh Hy). 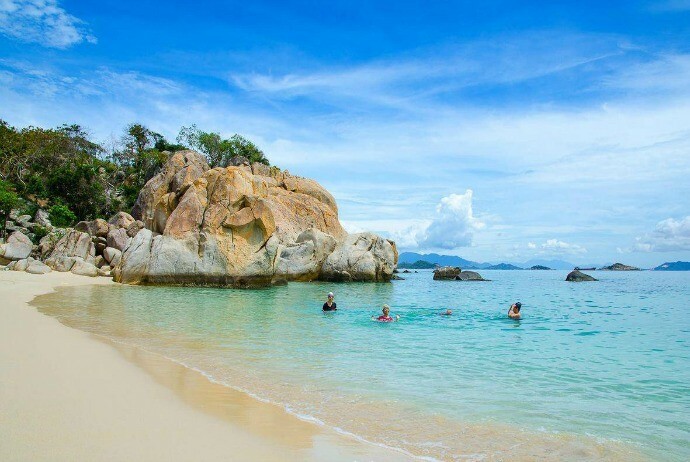 This island is famous for the white sandy beach and clear blue water. The island in Vietnam (Việt Nam) has not been exploited too much so it still retains many wild and fascinating features. Check out this article to see how beautiful Binh Hung island is! Binh Hung is also known as Hon Ty (Hòn Tý) island or Hon Chut(Hòn Chút) island. When setting the foot on this island, you will be attracted by the blue sea color and white sandy beaches. The beaches here are not as long and wide as those in Mui Ne (Mũi Né) and Nha Trang, but also clean and clear to the bottom. The sea is not deep, and you just need to wade out a few dozens of meters, you will see the coral reefs beneath. In particular, on the beach, there are stones of many shapes, colors and styles which are extremely vivid. People on the beach live mainly of fishing, particularly lobster raise. The house on the island are often located close together and faced to the sea. An impressive thing is that the roads around this island are very clean. Tourists could visit Binh Hung Island all around the year, but you need to avoid the months having rainstorms, such as September and October. The most ideal time for visiting this island is during summer months because at the time, the sea is quiet, so you will enjoy the landscape of white sand and blue sea in sunshine. 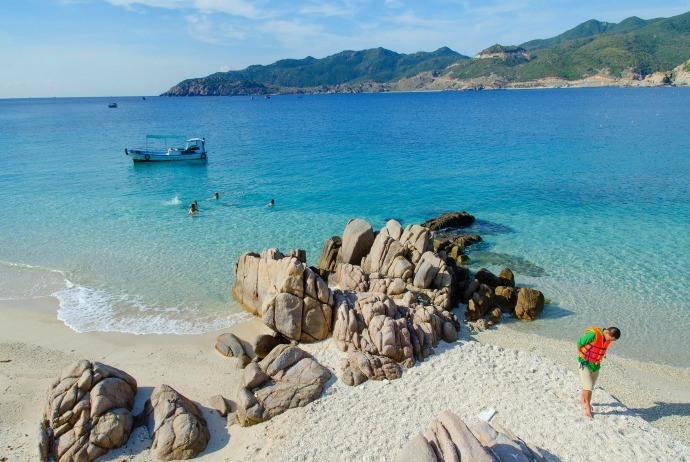 From Saigon, or Hanoi, you could take the airplane, bus, or train to Cam Ranh. To save time, tourists should depart at night from Saigon in order to get to Cam Ranh in the next early morning. 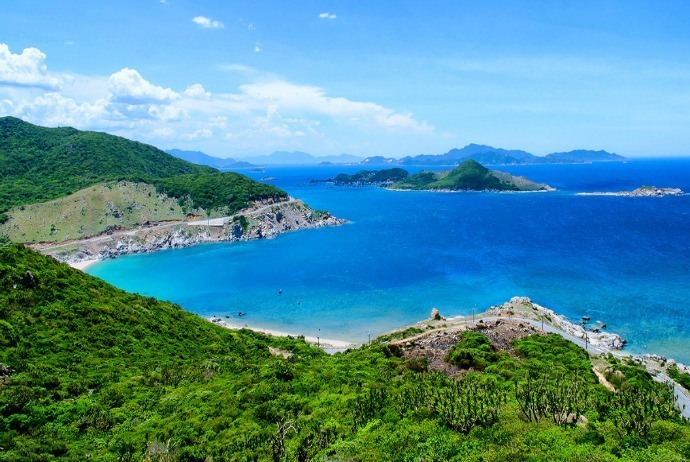 From Cam Ranh City, you can go along the 1A National Road following NinhThuan (Ninh Thuận) direction, then travel along the road to Binh Lap – Binh Tien (Bình Lập – Bình Tiên) (about 15km) to get to Bai Kinh – Binh Hung (Bãi Kinh – Bình Hưng). You can rent a boat to visit the sea cages of fishermen and enjoy the food right there. Particularly, the boat has a glass bottom which is very clear, so you can move while still enjoying the beauty of coral reefs. You could rent a motorbike at the hotel on the island for about 120,000 – 150,000 VND/day. As Binh Hung Island has a relatively small area, so tourists could choose to walk in order to slowly explore the island. 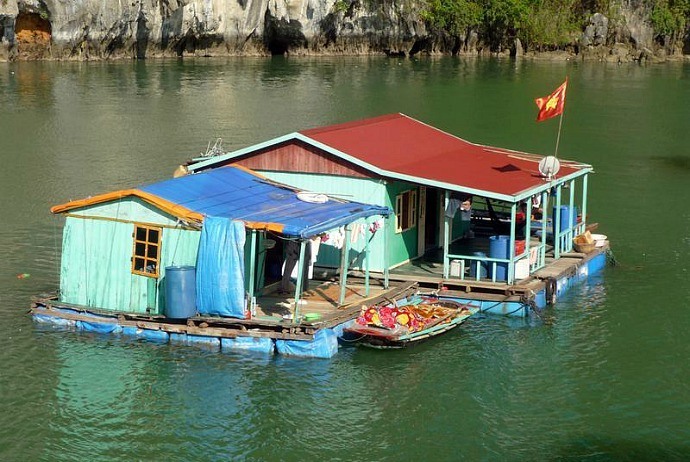 The owners of floating houses nowadays operate the service of lodging. Tourists could sleep on hammocks or on the mattress with the price of about 50,000 VND/night. This form is suitable for those people who want to experience the feeling of sailing to listen to the sound of waves or the throbbing voice when brandishing boat or rowing the fisherman’s basket. You can contact local people for this service. This form allows tourists to feel the comfort as well as attentiveness and caring of the hosts. The costs are about 100,000 VND each person for one day. The island has a number of hotels for tourists to rent with the price of 70,000 VND / person / night. In addition, tourists could also easily find the rooms with fans, air conditioning, and other good facilities. This mode is chosen by young travelers, tourist group or groups of backpackers. 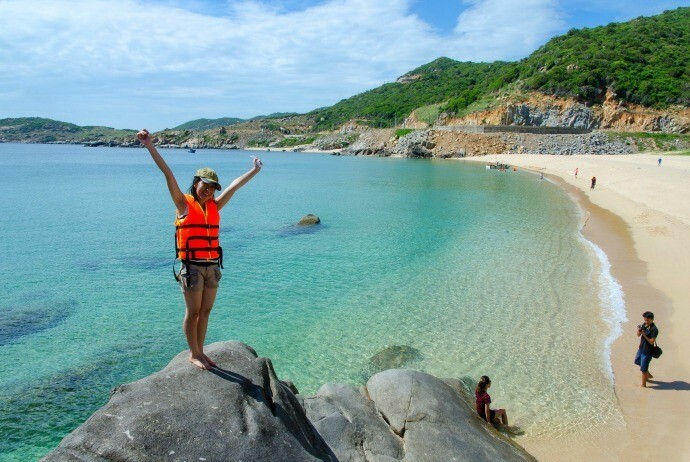 You can choose some beautiful beaches like Bai Kinh (Bãi Kinh) for camping or tenting up overnight. Located in Binh Tien village, this beach is the planned to become a resort by the local government so local people here have displaced over the ridge. However, over many years, this project has not been developed more so this beach still remains its unspoiled beauty. 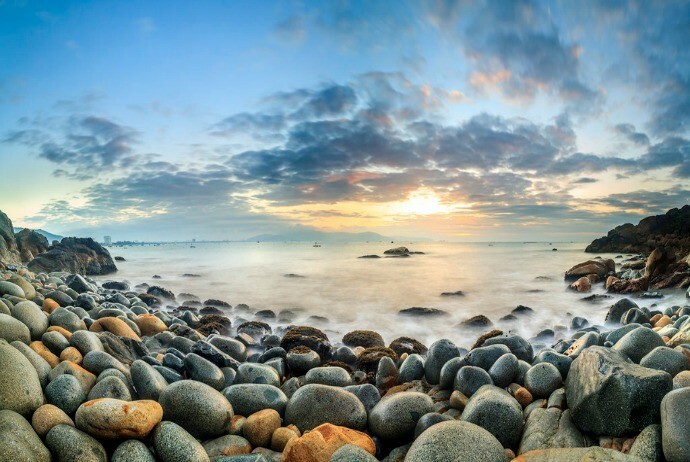 This is the first beach that you will set your foot on if visiting Binh Hung Island. Local people on the island use this beach for ship accessing between the mainland and island. The feature of this beach is its convenience for the movements of travelers. If going from mainland, you just need to park your vehicle on the parking site and walk down the beach before enjoying its beauty. If staying on the island, you can catch any boat /ship to go to the beach with just 10,000 VND/ person. The boats run continuously both day and night. The water here may be the clearest in the area. Moreover, this beach is shallow, so it is very suitable for the whole family to have fun. On the beach, there are a number of tent rental managers, with the price of 100,000 VND/ tent. The beach has the outside as a beach and the inside as a cave with fresh water. Clear blue sea water here allows you to contemplate the creatures swimming under the water. When the sea gets bored, you could move inside to have a bath with fresh water. 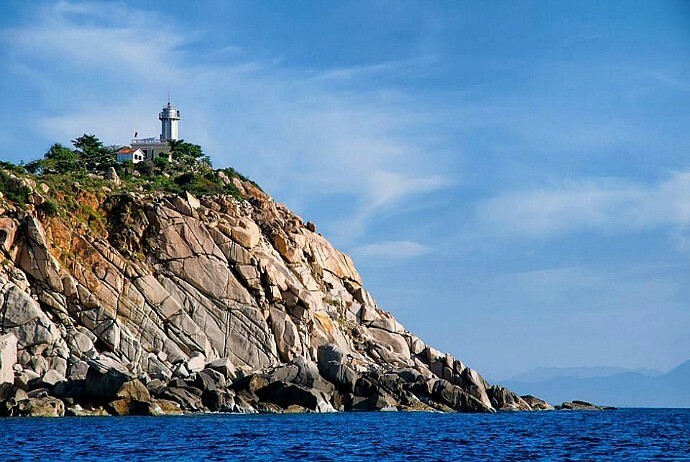 Along the small road up to Hon Bo mountain, you will be soon see Hon Chut lighthouse, which is the sea light presenting in front of Cam Ranh Bay having 100 years old. 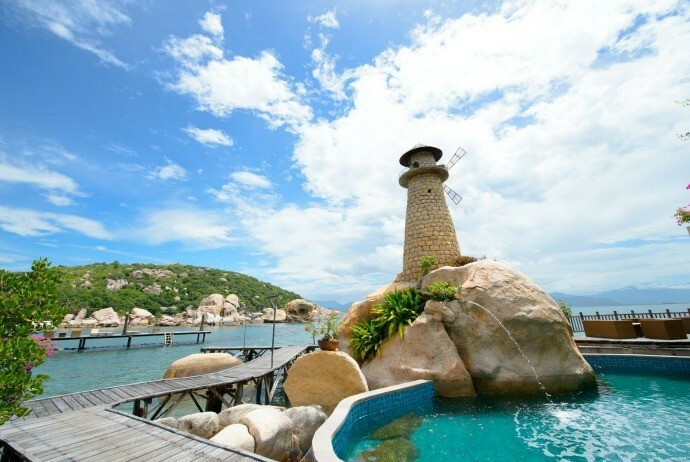 Standing on the lighthouse, you can observe the hustle of cargo ships in Cam Ranh port located to the west and see the panoramic view of vase waters dotted with little fishing boats. The beach has the largest sand edge in Binh Hung island. Also, it has the deepest level of water. You just should discover this island if you can swim well or it is the best to prepare fitted lifejacket when playing. The sand here is very clean, local people often take this sand to build their houses. The water here has green banana leaf color, which is very strange. If you have a chance to visit this beach, sometimes you will encounter foreign tourists swim here. In monsoon season, the beach has quite large waves so there is a little number of tourists coming here. The first impression catching your eyes when visiting this reef has giant, round dinosaurs’ egg-shaped stones. This reef is for visiting, not swimming because the entire beach is rocky so it is unsafe for swimming. In order to get this reef, you will need to walk up to the road to Hon Chut lighthouse, up close to the top, there is a road at the right hand to go down. The road to this reef is a mountainous road so it is not easy but not too difficult to follow. If you have enough health and excitement, it just takes 10 minutes to reach the reef. Located right on Binh Hung island, but in order to move to this beach, you have to rent the boat because there is not walking road to the beach. This beach is rather small and very clean. The color of water here has a blue color like it in the swimming pool. In the middle of the beach, there is very big rock, which is very suitable for standing here and posing. There are 3 famous type of lobster in Binh Hung Island with high export value, bringing the main financial resource for local people. Lobsters are often processed simply such as steaming, baking, or porridge cooking… but enough to captivate the diners with delicious and sweet flavors and fragrant. 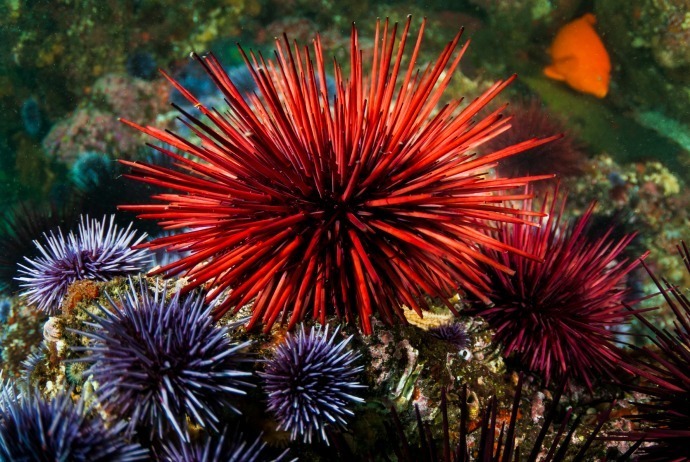 Sea urchin, known as CauGai(CầuGai) or Nhum in Vietnamese, is an easy to prepare dish which could be eaten alive with mustard, roasted with onion and butter. Particularly, CauGai soup distilled with eggs is a perfect combination between colors and tastes of foods, creating a nutritious dish and also an effective medicine for health improvement. When it comes to fish, maybe the most impressive fish is charcoal grilled Dzo fish, rolled with rice paper and some raw mango and fresh vegetables. 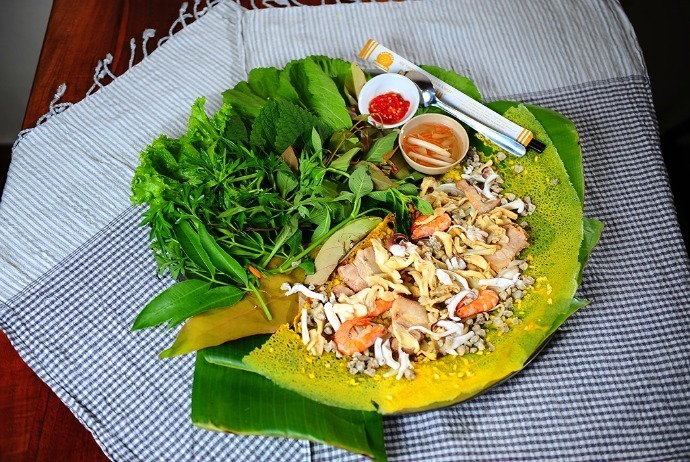 This dish is associated with fish sauce mixed with lemon juice, making you “forget the way to home”. The way to process seafood pancake here is not so different from that in other regions. In addition to the delicious stuffing made by shrimp, squid, clam, scallop, the difference making this dish special is that this dish has a medium size, slightly crunchy and yellow, and very little fat so it is not boring to eat. The sweet flavor of fish broth, a little sour taste of tomatoes plus with the greasy of fried fish and slightly spicy chili…. all of them create Binh Hung fish noodle which is strangely delicious, making diners unforgettable once having a chance to enjoy. If you have a chance to try a pie of Banh Can Muc in Binh Hung Island, you will certainly remember to heart. The main material to make this fish is rice flour and fresh squid. One indispensable tool is a hot brazier, a lot of terracotta molds. When putting the mold on the coal furnace, the mold will get hot, and then you can pour the powder prepared into the mold and stir up. It takes about 3 minutes to cook the dish which is crispy, aromatic and has excellent taste. You had better bring lightweight luggage, thin and cool cotton clothes. Do not forget bringing swimwear because the beach in Binh Hung is very beautiful. Bring sunscreen and raincoat to deal with the weather beforehand. Binh Hung is pretty wild, so you should bring a few snacks stored in the luggage in order to cope with hunger at any time.